THE PROBLEM: You just finished an amazing YA book and you eager to dive into the next great read, but you don’t know what to read next. Or alternatively, you’ve read something amazing and have been searching for the perfect follow up read, but have come up short every time. THE SOLUTION: Never fear readers, because Paws to Read is here to solve all your bookish problems! Introducing our weekly feature, Like? Try! Why? 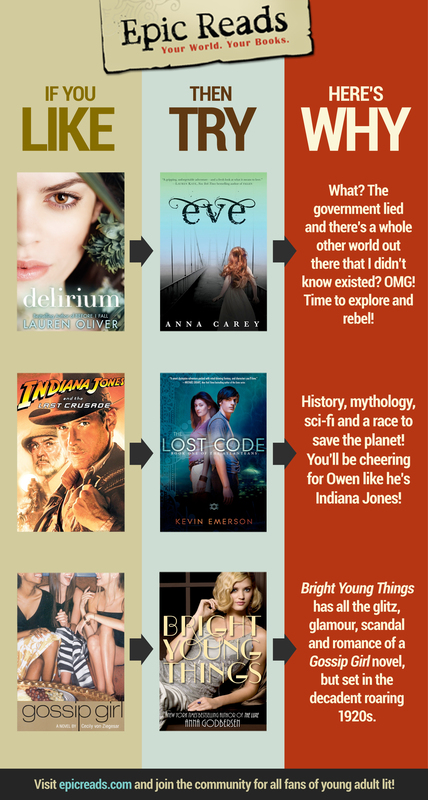 Each week we’ll pick a few popular books (and sometimes even TV shows or movies!!) that we adored and then PERSONALLY recommend what to read next. So sit back, relax and let this week’s Like, Try, Why introduce you to your next epic read! 6th grade students will be working in the library for the next two weeks in their ELA class to complete an online reader's profile and historical fiction research. We have been working on creating a comprehensive profile of each student as a reader, identifying their strengths and preferences while discovering a variety of tech tools that go hand in hand with reading. Attached is our template for the kinds of information we have been collecting and developing. book cover jpeg saved to file folder on netwtork. All students have the step by step instructions with examples in their shared 6th gr. Google Folder on Google Drive. Students will need to sign into Google Drive to access this. This can be done from any browser on any internet enabled device. It does not have to be Google Chrome but this works the best. You can refer the students to the project page for specific instruction and all necessary resources. Also, all instructions, handouts, examples, and the calendar can be found in our shared 6th grade Google Drive folder. of three pages in a single sitting. so that it is useful. as members of our democratic society. Absolutely great tool for book selection, both fiction and nonfiction! Lots of great tools to help you find the perfect book! You may need a username and password for home use. You will be working in a group to create our own version of a Like? Try! Why? poster, Paws to Read, to give PSMS students new ideas about what they might like to read. We will create a poster that can be displayed in the library and your group will have a chance to present your Paws to Read during a school broadcast to give our entire student body ideas about what to read next! Survey What Do I Read Next? Take the survey below and then hit submit at the bottom of the form!